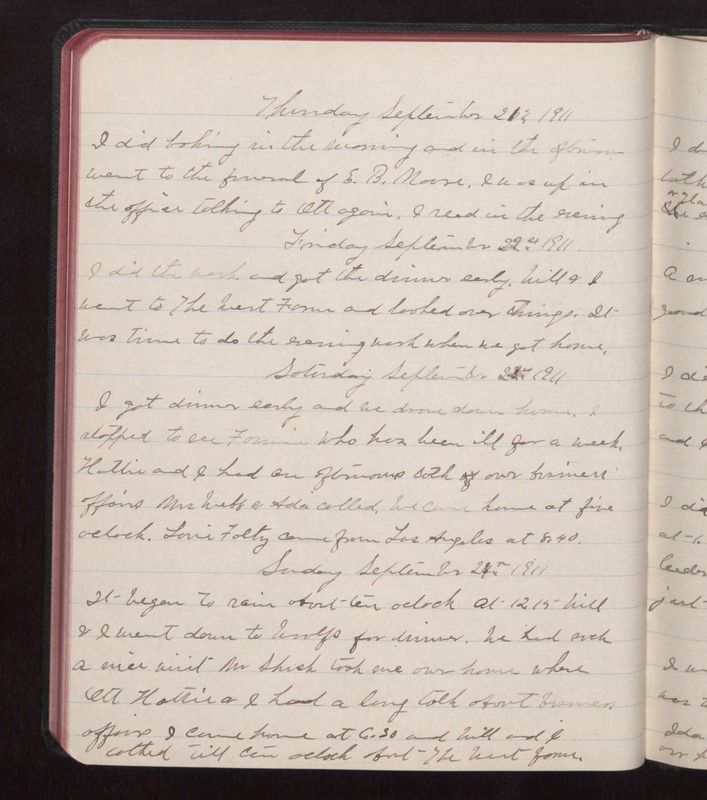 Thursday September 21 1911 I did baking in the morning and in the afternoon went to the funeral of E.B. Moore. I was up in the office talking to Ott again. I read in the evening Friday September 22 1911 I did the work. and got the dinner early. Will & I went to The West [Farm?] and looked over things. It was time to do the evening work when we got home. Saturday September 23 1911 I got dinner early and we drove down home. I stopped to see Fannie who has been ill for a week. Hattie and I had an afternoons talk over business affairs Mrs Webb & Ada called. We came home at five oclock. [Levi?] [Faltz?] came from Los Angeles at 8.40. Sunday September 24 1911 It began to rain about ten oclock at 12.15 Will & I went down to Woolfs for dinner. We had such a nice visit Mr [Shish?] took me over home where Ott Hattie and I had a long talk about business affairs I came home at 6.30 and Will and I talked till ten oclock about The West [farm? ].